We’ve known since the turn of the 20th century that some infectious diseases are a major risk for developing specific cancers. More worryingly, about one-sixth of cancers worldwide are attributable to infectious agents. Globally, more than 2m cancer cases are linked to certain carcinogenic viral , bacterial or parasitic agents. Two-thirds of these occur in developing countries. Although we’ve been aware of the connection between parasites and cancer since before the 18th century , we’re increasingly linking certain parasites to an increased risk of developing specific forms of cancer. For example, the fish-borne parasitic worms Opisthorchis viverriniand Clonorchis sinensis have been linked to increased risk of developing cancer of the bile duct (the tube that connects the liver to the intestines). Also, infection with the parasitic worm Schistosoma haematobium can cause bladder cancer . Worldwide, these three parasitic infections accounted for 8,300 new cancer cases in 2012. Infections can lead to cancer by directly manipulating the genes that control growth of the affected host cell – causing the cell to grow out of control. They can also cause cancer through long-term inflammation that leads to changes in the affected cells and in nearby immune cells or by suppressing a person’s immune system that normally helps protect the body from some cancers. But we also know that the body’s own immune defences can be used to fight tumour cells. And now a new study suggests that a brain-eating parasite that has been incriminated in cases of brain cancer can be reprogrammed to treat ovarian cancer. The team of investigators behind the new study set out to harness the immune system’s reaction to the presence of the parasite Toxoplasma gondii (T. gondii), which can be found in cat faeces, as a tool to cure ovarian cancer. Specifically, they identified specific proteins secreted by T. gondii that enable the immune system to attack established ovarian tumours in mice. This involved uncovering parasite specific proteins and associated host mechanisms that are important for the development of potent antitumor responses. The researchers deleted genes for proteins that the parasite injects into a host cell to modulate cell functions and immune response during infection. They also used the genetically altered parasites to vaccinate mice with aggressive ovarian cancer. The results showed that active parasite invasion along with specific proteins secreted before and after penetration of mouse cells elicited an antitumour response and increased survival by at least 40 days (mice only live a couple of years) compared to non-vaccinated mice. While surviving a longer period with cancer can be considered as an improvement, these results should be handled carefully because vaccinated mice didn’t get rid of the cancer completely and we do not know how this treatment could affect tumour regression in humans. In the field of parasitology no single parasite is as popular as T. gondii. This single-cell parasite, which affects one third of the world’s human population, is best known for its ability to invade and damage the brain and alter the behaviour of affected individuals. Long before the Zika virus became a serious concern for expectant mothers, infection with T. gondii was terrifying not only to pregnant women, but also to individuals with seriously compromised immune systems, such as HIV/AIDS patients or patients on cancer therapies. This parasite can be passed along from mothers to the fetus, putting the developing babies at risk of severe neurological and vision disorders. It is very intriguing that what used to be a disturbing infection could potentially now be the remedy for an even more terrifying disease. 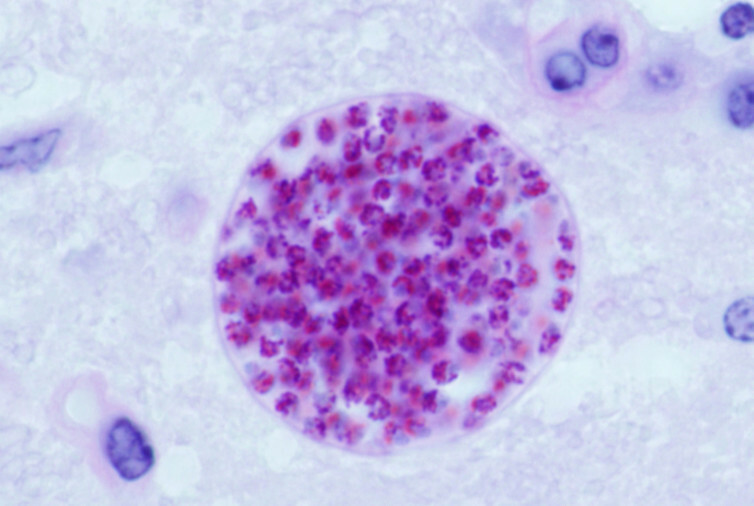 Toxoplasma gondii tissue cyst in mouse brain. The idea of turning immune defences, elicited by parasitic infection, against illnesses is not new. Some worms have been shown to lessen susceptibility to type 1 diabetes and other autoimmune and inflammatory diseases, as well as to promote wound healing. However, the potential of exploiting the immune responses associated with T. gondii to help the immune system recognise and attack ovarian cancer, which is difficult to treat, is definitely out-of-the-box thinking and deserves to be commended. The same group of investigators has previously shown that the use of attenuated T. gondii can generate longlasting immunity that protects against the recurrence of disseminated pancreatic cancer . But it is early days and much more work needs to be done to determine if a similar mechanism happens in humans. As more is learned about the dynamic cross-talks between this parasite, immune cells and tumours it may be possible that T. gondii or some of its proteins can one day become a real remedy that can be used to cure ovarian cancer and hopefully other forms of cancer, too.